Elegant solid sterling white diamond bangle bracelet made from 4mm wide and 2mm thick sterling rectangular wire. I flush set three 2 mm (3 points each) genuine ethically sourced diamonds in a slightly eccentric scattered pattern- 2 diamonds close together and one spaced about 1.5 inches away. (Total carat diamond weight is .09 carat). 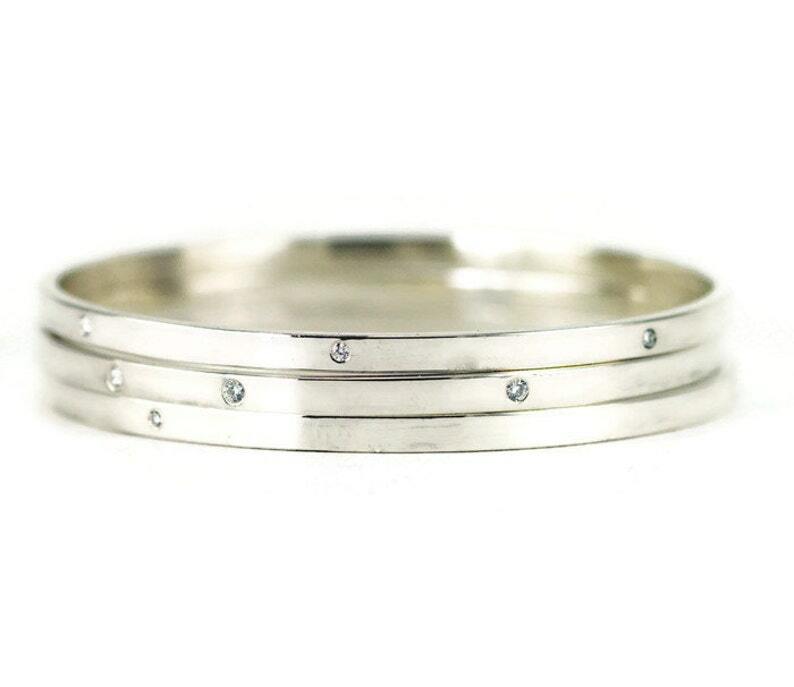 This diamond trio bangle can be made in oval or round. Diamonds can be set in any pattern you choose if you prefer different placement look at the main photo for ideas from the stack. Custom requests are welcome using colored diamonds or gemstones. Remember, bangle size is not the length of a bracelet with a clasp or based on your wrist measurement, see photo and how to measure directions below. This listing is for 1 (one) bangle only, if you need multiples, contact me for private listing. This bangle was designed to wear daily. It's heavy, it's classic and beautiful and will look stunning with whatever the occasion! I can hammer or oxidize this bangle at no additional charge if you want a more dramatic or rustic look. I show this bangle with the hammered texture in the last photo for you to have an idea of how that looks! Stones: 2 mm SI1 white diamonds, GH color, these diamonds are from a vendor who guarantees they are ethically sourced. These are eye clean diamonds, no visible inclusions. I can't stress enough the importance to measure carefully as directed below in "How to Measure" , the bangle must go over your hand. A re-size can cause flush set stones to loosen and the setting change shape from bending so a new bangle will need to be made. I do not make and keep these in different sizes for an exchange. If it's too big, I can cut it down but additional charges will apply if I have to re-set new stones. If you order too small, I need to make an entirely new bangle and additional charges will apply. This is a custom made just for you item. ***Consider asking for my "gifting card" if ordering as a gift and you cannot verify an accurate measurement before ordering. Requests for additional diamonds are charged wholesale at $35 each to cover the cost of the diamond and additional time setting the stones. **Measuring yourself: (see last photo example) Touch your thumb tip to your pinkie tip, then squeeze the rest of your fingers together on top of the thumb and pinkie- like you are putting on a closed bangle. Use a soft tape measure around the widest part of your hand- snug, but not too tight. Bangles are meant to slide on and move on your wrist, this measurement will determine the diameter needed for a comfortable fit! If you have a current bangle that fits- measure across and use the inside diameter to determine your size. These bangles are not in stock ready to ship, each is made at the time you order so please read my policies on returns before ordering and ask any questions you might have. Your bangle will be sent in packaging suitable for gift giving.